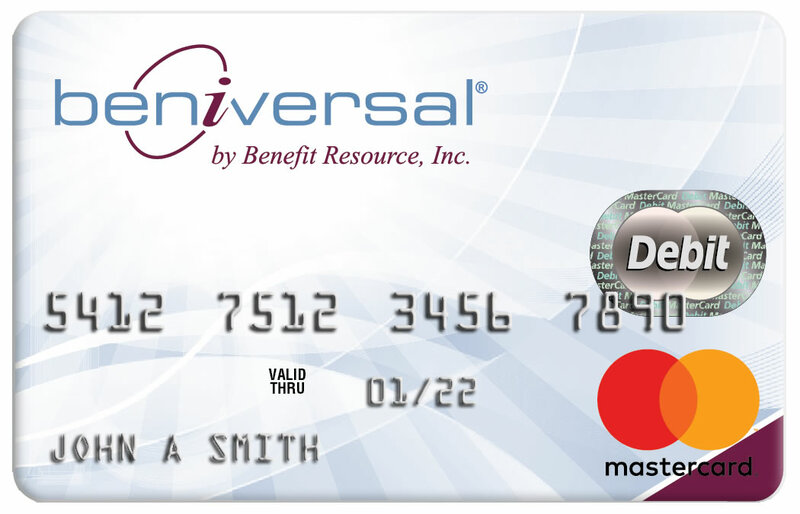 Beniversal Card | Benefit Resource, Inc.
Beniversal started as an idea that individuals should have universal access to their pre-tax benefits. Whether participants are trying to catch a train or pick up prescriptions, they should have a simple, no hassle experience. This concept becomes a reality through the Beniversal® Prepaid Mastercard®. Participants can conveniently access funds for eligible expenses through a single card source linked to their pre-tax benefits, including: Medical Flexible Spending Account (FSA), Health Savings Account (HSA), Health Reimbursement Account (HRA) and/or Commuter Benefit Plan (CBP). The card utilizes merchant, terminal and card payment rules to create a simple, convenient payment experience. With just a swipe of the Beniversal® Prepaid Mastercard® at a qualified merchant, necessary funds for the transaction are deducted from the applicable account. No waiting for reimbursement. Do receipts need to be submitted when the Beniversal Card is used? Participants should always keep receipts! The IRS requires administrators to ensure that 100% of FSA and HRA funds are used for eligible medical expenses. Benefit Resource has developed sophisticated technology and procedures to determine if a transaction is eligible. In the event that we cannot determine with certainty that the expense is eligible, we will directly contact the participant asking for further documentation. For HSA transactions, we will not request additional documentation, but participants should retain all receipts in case they are ever audited by the IRS. When participants utilize the multiple account technology of the Beniversal Card, they have instant access to mass transit and parking funds at approved merchants accepting Debit Mastercard. The Beniversal Card provides flexible payment options. Pay at point-of-service The Beniversal Card can be used directly at approved merchants providing mass transit and parking services. Pay based on a bill or invoice If a participant receives a bill or invoice for parking services and the approved provider accepts Debit Mastercard, the participant can provide the Beniversal Card number to initiate payment. Link the Beniversal Card to a reloadable mass transit card If a participant utilizes a reloadable mass transit card, the Beniversal Card can be linked to the reloadable card as the funding source. Our alliance with Mastercard International Incorporated assures broad acceptance among approved service providers and speeds the transfer of funds from cardholders to service providers. It gives participants easy card access to multiple tax-free accounts and adds yet another level of security—cardholders are protected from unauthorized purchases if their card is ever lost or stolen. Conditions and exceptions apply – see Cardholder Agreement. Card accepted at qualified merchants accepting Debit Mastercard.